If you configured remapping presets, you can apply one to a scene when importing it Control Center. Right of the Package Directory field, click on the Browse button. Browse to and select the .xstage file for the scene you want to import. Right of the Destination field, click on the Browse button. A File System Selector dialog appears. Select the Environments, Jobs and File System lists, select the environment, the job and the file system to which you want to import the scene. In the Data Options section, select the types of data you want to import with the scene into the database—see Importing Scenes to Control Center. Check the Remap Paths for Linked Palettes and Images option. 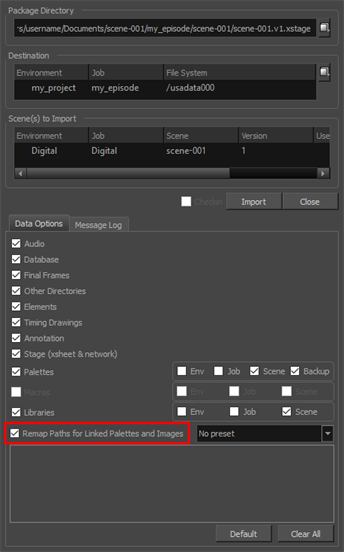 In the drop-down right of the Check the Remap Paths for Linked Palettes and Images checkbox, select the remapping rules group that you want to apply to the scene. The selected group of remapping rules is applied to the scene after it is imported. You can open the scene in Harmony to verify that all the assets are mapped to the right paths.